Life is filled with dreams. Dreams of traveling to exotic locations, studying and getting a degree, buying a new house, and, of course, landing your dream job. But, how “dreamy” are these jobs? Well, let’s not fool ourselves. 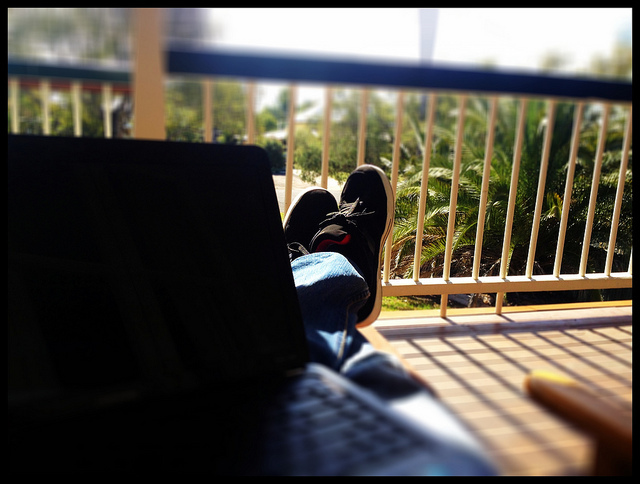 Working from home is freaking cool. Working from home offers flexibility that no on-site job can easily match. Your flexibility takes a great leap forward, and life and work can be organized around your specific needs. There are so many things to love. Working in your PJs or “going” to a meeting in the tacky sweater Grandma gave you for Christmas is totally acceptable; you only need to look decent from the neck up if you have a video call. Doing the laundry while sending an e-mail is a wonderful new spin on multitasking. And having the opportunity to change your “office” and its view, as often as you like, can be fun and energizing. But if you are seriously thinking of pursuing a telecommuting work opportunity, be ready to face some real challenges. Successfully working from home is a real art. My point of view is as one member of a team in a busy, dynamic, deadline-driven organization. If you are an entrepreneur with no one to answer to but yourself, your experience may be different. My goal is to share my experience and lessons learned, so you can approach your work-from-home career with open eyes and the best chance to make a successful transition. This post is the first in a series on the “art of working from home,” because I believe there is an art to making this type of “dream” job work for you in reality. Here I’m going to focus on travel when working from home, and next time, I’ll take a closer look at autonomy and how to stay on task. If you have any questions about working from home, I would be happy to answer them in future posts! Just leave a note in the comments for me below. You might envision a life in which you wake up whenever you want to, send some e-mails (if you feel like it) followed by a wonderful breakfast on a secluded beach in Thailand. Sounds amazing, right? But it’s not that simple, and the truth is that travelling while maintaining a full-time job requires an epic amount of planning and organization. Here’s my travel story: I recently decided to move to Nicaragua, because, first of all, I work from home (so why not, right? ), but also because it’s a beautiful country with natural wonders, a rich culture and amicable people, and a very affordable cost of living. I also found good opportunities to study, and plan to start two new engineering degrees here. Yet even though I planned my move in great detail, I still came across unplanned hiccups. I came down with two different illnesses in the first two weeks. It took me a full month to secure a stable Internet connection, after dealing with four different companies—all of which had previously assured me they could provide me with the service. These hiccups can and will affect your job performance, so be aware. When you work in a deadline-driven organization as I do, your downtime will affect others on the team and your job performance, so it needs to be minimized. My recommendation is to not take these moves lightly, recognize there may be issues, discuss your plan with your boss, and be selective about when you choose to travel. How do you make travel a part of your work-from-home career? Be honest with yourself about the extra turmoil travel will create and whether you can remain productive when you need to be. (Do you really want to put in 13-hour shifts to finish an epic project while you are in Rio during Carnival?) Keep in mind, your first priority will be getting your work done and done well. You may need to put in some extra time on weekends and evenings to catch up. Don’t be too ambitious. Try traveling locally first before tackling a more distant location. Closer-to-home locations will likely be in the same or nearby time zone. If you are staying local, you already know the culture, the language, and how systems work, so you can make the transition quickly. Plan, plan, plan. Then make a backup plan. Call ahead and make certain you will have a stable Internet connection and a quiet, comfortable place to work. Work with your team in advance to let them know the scope and duration of your trip. If you don’t abuse the privilege, in most cases your team will support you if unexpected situations arise. Stay positive when you need to make adjustments (and you will!). My final tip for traveling while working from home? Smile and enjoy! You deserve it after all the effort you made to ensure things run smoothly. Use your time outside of work to experience your new surroundings, and return to your “office” renewed and ready to jump in and be productive. Working from home can be an incredible, life-expanding experience, as long as you put in the effort to pay close attention to the transition and craft a formula that works for you. I’ve gone through my transition and I can tell you it can work, and for me it would be hard to give it up. If you are ready for this challenge and opportunity, I welcome you to the tribe of the moving laptops! Photo Credit: Matt Crawford, Flickcr.com Creative Commons. Great article, Randall! Though I have had a home office for 15 years for my various consulting projects, I have worked at home full-time for the last seven years. I agree with everything you discussed. When it comes to traveling abroad or to interesting destinations, it is really best to save your vacation time for those locations. Enjoy your time away and immersion in a new culture. However, what I do frequently is visit family and friends in different locations around the country. The change of pace really does wonders for the psyche. During these “working vacations, you can keep travel costs down and make use of your hosts’ established internet connection. You and your hosts can work during the day and enjoy evening and weekends together. It gives all of you a chance to explore the area since locals don’t typically do touristy things. Don’t overstay your welcome however. An enjoyable visit is typically 3 to 5 days. Your comment is right on point and it also makes me think of all those times I´ve done just the same thing as you describe, mostly with friends and family. These “work vacations” are a wonderful way of not only visiting those you love, but changing the pace of our regular life routines, as you well put it. Thank you for your comment and let me know if there´s any subject that you would like to see developed into an article in the future.